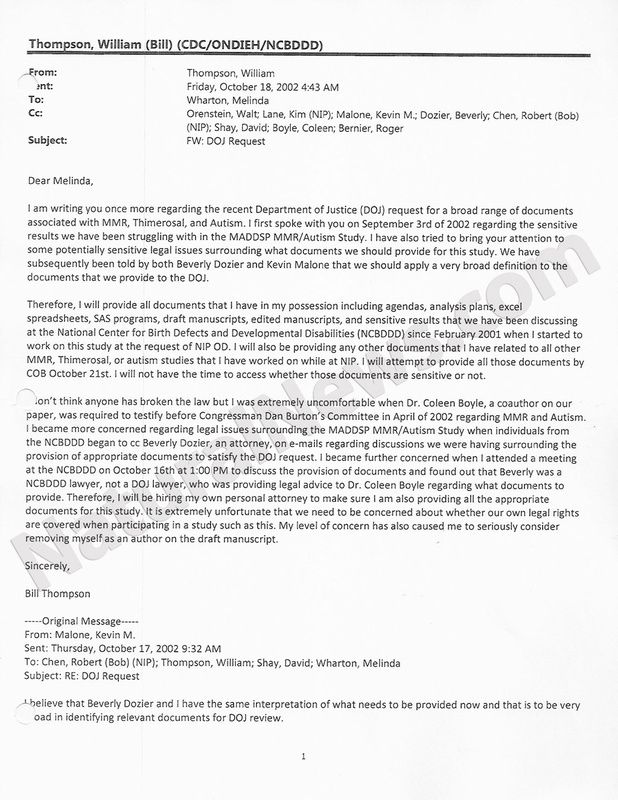 Dr. Thompson had brought up the issue back in October of 2002, when he asked for a full review of legal documents that should have been provided for the study on the autism link and how toxins like mercury are leading to neurological disorders. The risk of autism rose 340%, according to Thompson, for African American boys getting the MMR vaccine before age three. The CDC email reveals the vaccine cover up. An article published at the time details the finding, but the CDC officials retracted data in order to skew the published results, hiding this autism epidemic’s root cause from hundreds of millions of Americans who need to know the truth. The article was later removed from the scientific journal stating errors–errors that were never found. For twelve years, the CDC has covered up vaccine violence, where chemical and synthetic and heavy metal toxins used as preservatives, emulsifiers and adjuvants (carriers) are causing brain damage and central nervous system damage and immune system damage in children across the United States. Dr. William Thompson posted his confession relating to all of this on the website of the law firm representing him (Morgan Verkamp, LLC). Dr. Thompson’s colleagues buried the report, in other words, and buried children in that process, and maimed innocent children in that process, and ruined the lives of children in that process, and burdened their parents for life, in that process–of burying that report. Thompson just couldn’t take the weight of the guilt any longer and “blew the whistle,” protected by his attorneys all the while. The confession and admission of wrongdoing by Thompson only surfaced AFTER Natural News published secret emails exchanged between Thompson and his CDC colleagues regarding the massive controversy and cover up. This is a true “Paul Revere” moment in medical history and the message comes from the inside–avoid toxic vaccines. All of this historic information is completely blacked out by the mass media, including television, newspapers, magazines, hospital protocol, scientific journals, peer review publications, and any other business that sponsors allopathic chemical medications. The vaccine industrial complex controls the script regarding vaccines, so the only place to find out the truth is from truth media, alternative news, Natural Health News and the Next News Network. When Natural News and Mike Adams published the first secretive emails by Thompson, the vaccine establishment accused Adams of fabricating the two emails, until Dr. Thompson went public with his confession, and then came the great blackout in mass media. This is medical fraud at the highest level, with medicine that is supposed to protect humans from disease, disorder and immune malfunction, yet this very same medicine is CAUSING these (preventable) mental and physical health atrocities. He goes on further to ask Dr. Gerberding for her leadership skills (he’s very complimentary of her) in being proactive in addressing his concerns. He explains how scientists at the NIP – National Immunization Program – have not responded to several issues he has brought to their attention to date. Though anyone else would be a “wanted man,” nobody is going after the fraudster Thorsen because his fraudulent study results are exactly what the CDC needed as a “precedent” or “landmark” study they could refer to whenever families sue the vaccine industry for millions for vaccine violence and damages. It was all staged so if Dr. William Thompson’s complaints ever really surfaced about MMR, they could snuff public concern with the Danish Autism Study (complete myth) made up by Thorsen. Thorsen meanwhile is back in his home town with the two million dollars, continuing to produce more pro-vaccine propaganda, and his study, though completely debunked, is still sourced and cited by the CDC and pro-vaccine propagandists across the mass media and “science-based medicine” and allopathic chemical medicine spectrum. Poul Thorsen will most likely continue to be a leading source for the CDC’s claims that mercury is safe for INFANTS and children, as long as Thorsen can keep his own name out of the network news and the US newspapers. Paul Thorsen faces hundreds of years in prison and over $22,000,000 in fines if convicted on all charges. There are crucial implications here that the majority of the American public does not know and may never know. Vaccine ALWAYS COME WITH RISKS, the CDC has the moral obligation to communicate these and the CDC has failed to do this. Dr. Thompson’s confession is the smoking gun, and the fraud he revealed dates back over a dozen years. It’s still going on. The MMR vaccine is still being dished out to little African American boys with no NEW warning on the insert! The CDC is still referring to the Danish Study as legitimate. It’s scientific quackery at the highest level and it’s sponsored by Big Pharma and the Vaccine Court slush fund that quietly compensates parents of vaccine-damaged children, while the rest of America is force vaccinated and fake measles outbreaks are staged at Disneyland. Granting Dr. Thompson immunity and testimony before Congress – is that next? Operating the CDC with the most ethical and moral standards possible is obviously at the heart of what Dr. Thompson is supporting. He is risking his career and possibly his life by telling the American public that the other scientists at the CDC commit fraud and alter results and statistics of the most important research on medicine being done for allopathic America. The US government needs to step up and protect these true patriots and hard-working professionals who are looking out for the best interests of the people they represent who pay their checks via taxes to do exactly that. Hopefully soon, when there is a new President, Dr. Thompson will be given the chance to testify before Congress about dangerous medicines and also propose safe or at least safer study protocol and non-toxic vaccine ingredients. Dr. Thompson should be awarded some kind of medal for honor and courage, and his breaking of the silence regarding autism being DIRECTLY caused by vaccine chemicals and heavy metal toxins – specifically mercury in the MMR, Measles-Mumps-Rubella inoculation.